Home » Community » The 59TH ANNUAL WHITE ELEPHANT SALE IS HERE! The 59TH ANNUAL WHITE ELEPHANT SALE IS HERE! It’s that time of year again! 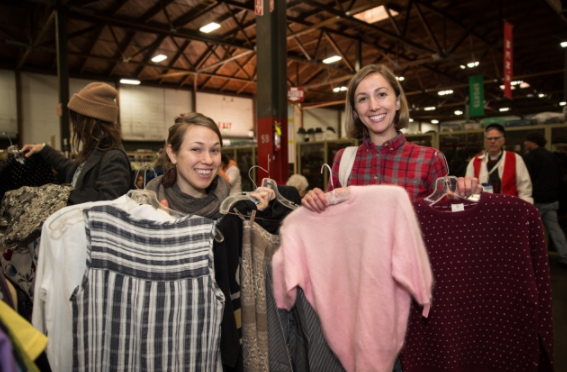 The 59th annual White Elephant Sale in Northern California returns to Oakland March 3 and 4, 2018. It will feature 19 departments in a 96,000 Square Foot Warehouse. Items include, furniture, artwork, household goods and china, sporting gear, fine jewelry, collectibles, tools, music, books, vintage and contemporary clothing. A preview sale will take place on Sunday, January 28 from 10 am to 4 pm. The event is organized and presented by the Oakland Museum Women’s Board and benefits the Oakland Museum of California. For the past three years, the Sale has raised over $2 Million. The event is made possible by donations from the public and is run by more than 1,000 volunteers. Antiquers and bargain hunters often look forward to this event all year. It’s not uncommon to see rented trucks outside the door. You’ll want to wear comfortable shoes and arrive early. You can easily spend all day there looking for treasures for your home. 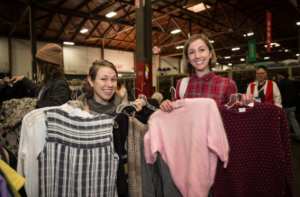 There will be a complimentary shuttle service from the Fruitvale BART to the WES warehouse provided for the January 28 Preview Sale and on the March 3 and 4 White Elephant Sale days. Preview Sale tickets are $15 in advance at the OMCA Store, $16 online through the WES website, and $20 at the door. Tickets can be purchased in advance starting December 13. More information on how to purchase tickets can be found at WhiteElephantSale.org. Children under 12 are admitted free to the Preview Sale but must be accompanied by an adult at all times. Admission is free for the main event on March 3 and 4. Donations of gently used good quality items are accepted year-round. For free van pickup call 510-839-5919. Visit WhiteElephantSale.org for donation information, including on which days drop-off donations are accepted at the warehouse at 333 Lancaster Street in Oakland, and a list of items that cannot be accepted. The sole purpose of the Oakland Museum Women’s Board (OMWB), a dedicated group with 114 year-round members, has been to raise money to support the Oakland Museum of California acquisitions, exhibitions, educational programs, capital improvements, and more. Since 1959, the OMWB has contributed over $22 million to the Museum. With the help of a thousand dedicated volunteers, they work year-round to organize and present the White Elephant Sale held annually during the first weekend in March which attracts shoppers from the Bay Area and beyond. The Oakland Museum of California (OMCA) brings together collections of art, history and natural science under one roof to tell the extraordinary stories of California and its people. OMCA’s groundbreaking exhibits tell the many stories that comprise California with many voices, often drawing on first-person accounts by people who have shaped California’s cultural heritage. Visitors are invited to actively participate in the Museum as they learn about the natural, artistic and social forces that affect the state and investigate their own role in both its history and its future. With more than 1.9 million objects, OMCA is a leading cultural institution of the Bay Area and a resource for the research and understanding of California’s dynamic cultural and environmental heritage.